Shell Pernis is de grootste raffinaderij van Europa en één van de grootste raffinaderijen ter wereld. Het bedrijfsterrein biedt naast olieverwerkende fabrieken huisvesting aan chemische fabrieken van Shell en van andere bedrijven. 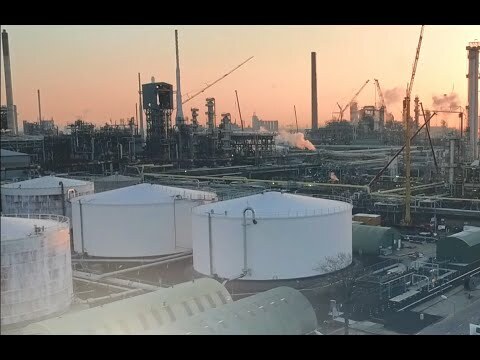 This video describes the large-scale 2019 maintenance stop taking place at Shell Pernis, where the plant is being inspected, cleaned and improved. The Sound of Shell orchestral adaptation with keys intro. Slowly panning bird’s eye view of Pernis petrochemical complex, large cylindrical white storage tanks in the foreground, with smoke rising in the background into a pink-hued sky from which a muted sun shines; title text displays over the footage. Closer panning bird’s eye view of the upper structures of a section of the Pernis complex, with Botlek bridge and the port in the midground and pale skies and green landscape in the background. Panning bird’s eye view of the upper structures of a section of the Pernis complex, industrial smoke rising from the plant. At the moment, we employ almost 3,000 people. Panning low angle footage of industrial plant infrastructure set against a blue sky; pipes and structural components pass the shot in the foreground as the shot pans. Tilting wide angle footage of a group of workers wearing safety gear, standing alongside pallets and other industrial equipment and machinery in a paved area of the plant complex; multi-level industrial plant infrastructure stretches around the outskirts of the paved area beneath blue skies. Mid-view footage of two of the workers wearing blue protective clothing and white hardhats along with other safety gear; one of the men lifts his arm to point forwards as he speaks, and the second man whips his head around to look in the direction he is pointing. Tracking slow-motion, reverse view footage – creatively overexposed with a sunlit haze – of a worker, wearing safety gear, carrying a long, narrow metal grid in one arm, extending over his shoulder, walking through a section of the plant. Eventually, we'll have accumulated 1.3 million man-hours, but in a safe way. Close-up shallow-focus footage of Michiel Bedaux speaking to an off-camera interviewer, seen against the blurred background of the plant complex; Michiel is wearing safety gear, including Shell branded hardhat and protective clothing. Tilting footage of the plant complex below pale blue skies, a large white cylindrical storage tank partially visible in the foreground; the shot tilts slowly and then rapidly upwards, halting on a wide bird’s eye view of the Pernis plant complex, a plume of white smoke rising into blue skies, with the surrounding countryside forming the background. Slow motion mid-view footage of a group of workers, all wearing safety gear, walking towards the shot against the background of plant infrastructure. It's really all about the people. Mid-view footage of three workers posing behind a metal railing, two of the men giving thumbs up signals; the men are wearing protective clothing, gloves, safety glasses and white hardhats, and are seen against a background of plant infrastructure. Close-up of two workers guiding a piece of heavy machinery slowly downwards, the worker facing the shot speaking to the other as he works; both are wearing protective clothing and white hardhats and are seen against a background of plant infrastructure. You can rent or buy materials, tools and machines. But selecting the right people at Shell and the contractors is crucial. Close-up shallow-focus footage of Andre Lambermon speaking to an off-camera interviewer, seen against the blurred background of the plant complex; Andre is wearing safety gear, including Shell branded hardhat and protective clothing. People who want the factory to be ready in a safe, good and timely manner, and in that order. Panning mid angle footage of a group of workers standing in a semicircle in the plant, engaged in discussion; the workers are wearing protective clothing, safety glasses and hardhats. Aerial footage of a worker cutting a piece of wire from amongst the exposed wires of a cable he is holding; he is wearing protective clothing, gloves, and a white hardhat, and is seen against the wire mesh background of a section of raised infrastructure. Close-up shallow-focus footage of Andre Lambermon speaking to an off-camera interviewer, seen against the blurred background of the plant complex, as before. Wide angle bird’s eye view of the plant complex, industrial smoke rising into pink hued skies from which a muted sun shines. Rapid and then slow pan over the plant complex. Slightly panning bird’s eye view of a narrow, tall building against which the Shell Pecten displays; in the background, we see the plant complex. We are at Shell Pernis, the largest refinery in Europe. Bird’s eye view of a section of large white cylindrical storage tanks, the closest tank displaying a large Shell Pecten on its side. Wide angle bird’s eye view of the Pernis complex beneath pale blue skies. Our 66 factories process 20 million tonnes of oil on a site as big as 800 football pitches, where we are now performing a maintenance stop. Close-up footage of Jos van Winsen speaking to an off-camera interviewer, seen standing against the background of the Rotterdam port. Slightly panning bird’s eye view of a large section of the industrial plant complex with white smoke rising from the plant; a channel of water is seen in midground. Aerial time lapse footage of a section of the plant complex, including tall tanks and multi-level plant infrastructure, seen through clouds of smoke passing above the structures. Bird’s eye view time-lapse footage of illuminated industrial plant infrastructure seen below darkening blue skies; in midground, a crane arm swings around a tall cylindrical tank which is suspended from the crane’s hook. Low angle footage of an orange crate being hoisted against a backdrop of plant infrastructure. Aerial footage of a worker pulling a large cable; he is wearing protective clothing, gloves, and a white hardhat, and is seen against the wire mesh background of a section of raised infrastructure. Panning low angle footage of tall steel plant structures seen against a brilliant blue sky. It's wonderful to see that we are working together safely and efficiently. Reverse view tracking footage of a group of workers walking along a paved area in the plant, flanked at left and right by plant infrastructure; they are wearing protective clothing and hardhats. Aerial footage of a worker manually pulling down on a chain hoist; he is wearing protective clothing, gloves, and a white hardhat, and is seen against the metal and wire mesh background of a section of plant infrastructure. We are inspecting and cleaning things. We repair things, where necessary, and we replace things. Close-up shallow-focus footage of Michiel Bedaux speaking to an off-camera interviewer, seen against the blurred background of the plant complex, as before. Low angle footage of tall structures within the plant seen against a blue sky and glaring light from a high sun. Close-up of three workers huddled together in discussion; they are wearing protective clothing, gloves, safety glasses and hardhats. Low angle footage of a swivelling crane cab, seen against a brilliant blue sky. Zooming close-up of a worker looking skywards; he is wearing protective clothing, gloves, safety glasses and a white hardhat, and is seen against the background of plant infrastructure. Low angle reverse view of a worker standing in a raised safety cage alongside the metal structures of a Liebherr crane seen against blue skies; he is wearing protective clothing and a white hardhat. That everybody goes home safely every day. Panning wide angle bird’s eye view of the Pernis complex beneath grey skies. Low angle footage of a slowly swivelling crane arm seen against brilliant blue skies. High angle close-up of two workers, wearing safety gear, around an industrial pipe flange, one bent down in front of the pipe end at lower frame centre with his face obscured, while the other tightens bolts around the upper section of the flange. The team spirit is very good. Close-up Andre and a colleague engaged in discussion in the plant; both men are wearing protective clothing, safety glasses and hardhats. Andre’s colleague, who has on a hi-vis jacket, pats Andre’s arm as they both start to move off. It's important that if we have setbacks - and they always occur – we keep helping each other and remain respectful towards each other. Panning mid angle footage of a group of workers in the plant, all wearing protective clothing, safety glasses and hardhats, some with safety earmuffs; while some workers start to move off, others stand together, engaged in discussion. Close-up shallow-focus footage of Andre Lambermon speaking to an off-camera interviewer, seen against the blurred background of the plant complex, as before. Panning bird’s eye view of the upper structures of a section of the Pernis complex, with Botlek bridge and the port in the midground and pale skies and green landscape in the background. It's one team - the operation, maintenance, the contractors... It's like playing on some of the pitches at the highest level to create a very good stop, so that these factories can operate for four to six years continuously to get the level of production that we all need. Footage of a digger vehicle passing the shot in midground; we see a blurred piece of equipment in the foreground at frame left, and plant infrastructure in the background. Low angle close-up of Michiel and a colleague standing alongside one another in the plant, engaged in discussion while, in the midground, a tanker passes behind them; both men are wearing protective clothing, safety glasses and hardhats. Mid angle footage of several workers approaching and passing the shot; all of the workers are wearing protective clothing, safety glasses and hardhats, and the workers passing in the foreground are strapped into harnesses. Low angle close-up of a Shell-branded yellow tanker slowly passing the shot; in upper frame left, we see plant infrastructure and pale blue skies in the background. Slightly panning bird’s eye view of a large section of the industrial plant complex, with smoke rising from the plant. Close-up footage of Jos van Winsen speaking to an off-camera interviewer, seen standing against the background of the Rotterdam port. We slowly pull back on a bird’s eye view of Pernis petrochemical complex, large cylindrical white storage tanks in the foreground, with smoke rising in the background into a pink-hued sky from which a muted sun shines. Dissolve to white. Shell brand mnemonic played on keys. © Shell International Limited 2018. Avond shot: Wijd shot van SDA-complex vanaf het water. naar het SDA-complex vanaf het water. Avond shot: close-up van het gezicht van mannelijke bijstander die in de verte staart. Avond shot: close-up van het gezicht van glimlachende vrouwelijke bijstander die in de verte staart. Avond shot: close-up van het gezicht van vrouwelijke bijstander met bril die in de verte staart. Avond shot: Close-up van Jos van Winsen die een microfoon vasthoudt en in de verte staart. Avond shot: Meerdere mensen die in de verte staren met de focus op een man met zwarte jas. Avond shot: Tilt van onder naar boven SDA-complex. Avond shot: Zoom out gedeelte van het SDA-complex. Avond shot: close-up SDA-complex, tilt omhoog. Avond shot: close-up van 3 mannen die met elkaar praten. Shot buiten naar binnen van man met bril in een rode Shell overall die zachtjes in een auto rijdt. Avond shot: slow motion shot van grijze persoonswagen die langs SDA complex rijdt. Muziek zwelt op en eindigd abrupt. Wij zijn Shell Pernis. Maak kennis met de grootste en meest complexe raffinaderij van Europa. The future of Shell Pernis - increasingly cleaner products, safety and the environment, an intensive bond with our environment, and future vision. Panoramic time lapse footage, as seen across a body of water, of an industrial plant complex, a tall chimney and other structures reaching up into a blue sky filled with scudding clouds. Mid view of a smiling young woman wearing safety gear, standing against the background of industrial plant infrastructure. Mid view of a smiling young man wearing safety gear, an internal plant floor forming the background. Mid-view of a smiling young woman wearing a white laboratory coat and safety goggles, a laboratory setting forming the background. Mid-view of another smiling young man wearing safety gear, an internal plant floor with machinery forming the background. Mid-view of a smiling woman wearing safety gear, standing against a background of large pipes and industrial plant infrastructure. Mid-view of a smiling man in a blue shirt standing just outside the entry to the floor of a section of the plant. Now and in the future, it remains our ambition to deliver every more efficient, dependable and cleaner products. Panning low angle side view of a Shell-branded tanker truck, industrial plant infrastructure in the background. Bird’s eye view of an industrial plant complex, blue skies with dark clouds seen above. Wide side view of a vessel in the harbour, the industrial plant complex visible in the background. Side view of a long workstation countertop for multiple users, one man seated at his workstation in the middle distance, looking at one of the screens facing him. High angle view of a laboratory setting, people wearing white lab coats working at various points in the lab. Mid-view of two people wearing white lab coats and, gloves and goggles, working with chemicals at a lab counter. Mid-view in profile of a man seated and working at one of the workstations. Footage of a man dressed in safety gear cycling towards the shot, industrial plant infrastructure visible in the background. Wide view of a car pulling into a Shell service station and parking at a petrol pump. We are Europe’s largest refinery. Our site, including Shelll Europort is almost as large as 1,000 football fields. We have 1,900 employees working in 60 different plants. Reverse view footage of a worker carrying a container and walking across grass to an area of large cylindrical oil storage tanks. Miscellaneous views of industrial plant complex from various angles. Reverse view footage of the man cycling through the complex. Miscellaneous footage of workers moving about and working within the plant complex. All of the plants are interconnected by pipelines. The network consists of tens of thousands of kilometres of pipes. Locations like our chemical plant in Moerdijk, Schipol, and industrial zones, like Antwerp and the Ruhr Area, are connected to our company through underground pipelines. 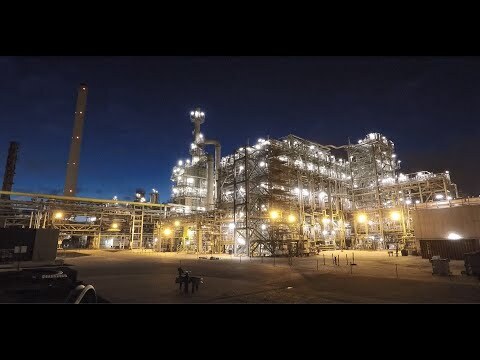 Panning footage of the piping and structures of multi-level plant facilities from various angles. Footage of parallel lengths of large pipes in a plant, running between grass covered banks, with the oil storage tanks in the background. More panning close-up footage of the plant’s piping and structures. Wide footage of gate one, Shell Chemie Moerdijk. Miscellaneous footage of industrial plant complexes as well as closer shots of the infrastructure. The Port of Rotterdam is the largest in Europe, partly due to the supply of large quantities of crude oil and the extensive trade in oil products. Miscellaneous footage of the port, including vessels and jetties, with wind turbines and plant infrastructure in the background. Low angle footage of the oil storage tanks, grass-covered banks in the foreground, wind turbines turning in the background. The oil is stored in tanks at the Maasvlakte and at Shell Europort, and then it’s pumped to Pernis. Low angle footage of a sheep eating grass, the storage tanks in the background. Wide front-view footage of a worker crossing a narrow metal bridge which runs from the storage tanks, down a grassy bank and over the large parallel pipes. More footage of the storage tanks and piping infrastructure below. We can process both light and heavy grades of crude oil. Panoramic time lapse footage, as seen across the water, of an industrial plant complex, the tall chimney and other structures reaching up into a blue sky filled with scudding clouds. Footage of a woman dressed in safety gear cycling towards the shot, industrial plant infrastructure in the background. Bird’s eye view of a Shell tanker truck driving along a highway. The most important products we make are: gasoil/diesel, petrol, kerosene and LPG. Extreme wide view of a man wearing safety gear cycling through industrial plant complex. The refinery also makes other products like bitumen, sulphur, solvents and base chemicals, for example, for Shell Moerdijk. Panning bird’s eye view of industrial plant complex. When the plants operate at full speed, we process over 400,000 barrels of crude oil per day, which equals 20 million tonnes a year, or 750 litres per second. Footage of a women wearing safety gear ascending the maintenance ladder of a storage tank, stopping to fill plastic containers with oil from the storage tank, and carrying the container of bottles back down the ladder. Products made in the refinery plants include polyols, propylene and solvents. Footage of the aforementioned worker crossing over a narrow metal bridge that runs across pipes and plant infrastructure. Panning bird’s eye view of plant facilities. Panning footage of packaged products on a supermarket shelf; a hand lifts one packaged item off the shelf. We supply them to other companies which process them into products like mattresses, glue and packaging materials. Low angle footage of industrial plant infrastructure against a blue sky. The way in which we process our oil goes as follows... We start with distillation. The molecules in crude oil are split up into different components, based on different boiling points. This happens in a distillation tower. We heat the crude oil to a temperature of about 350 degrees Centigrade, which causes the lightest molecules or fractions to evaporate. This vapour then rises in the tower. The higher up in the tower, the lower the temperature. Thus, condensation will ensue causing the gaseous molecules to turn back into fluids at different heights. Animated graphic, picturing a distillation tower with a pipe entering from frame left, crude oil – indicated by black shading – entering the distillation tower, the level of black shading in the distillation tower slowly rising. At various levels of the tower, lines extend from the tower towards frame-right, with text descriptions. The graphic zooms to the base of the tower, where a temperature gauge graphic within the tower indicates rising temperature, using red shading. Further red shading slowly travels up the tower above the black shading. Successive levels of shading appear in orange, dark green, light green, dark blue, light blue, then white, as the graphic zooms out again, and the white shading continues through the pipe which extends out of the top of the tower. Bird’s eye view of an industrial plant complex, including the oil storage tanks, one emblazoned with a Shell pecten; traffic moves along highways in the foreground. Panoramic shot of industrial plant facilities, seen across a body of water, some foliage visible in the foreground. Moreover, we can turn almost all crude oil into lighter products. To this end, we use not only distillation but also cracking processes. Through heat and catalysts, we crack the molecular chains, as it were, in order to produce smaller and lighter components. These products can then be used for petrol, kerosene or diesel. Our aim is to keep reducing safety hazards. Animated molecular structure zooms in, rotating against a blue background while lines form to connect all of the molecules as it fills the frame. Then, the overall structure breaks into smaller molecular structures which rotate away from one another. Superimposed on this graphic, three orange barrel graphics appear alongside each other across centre-frame, text indicating the content of each barrel. We do this with careful designing and robust construction, through regular maintenance and with a high training level of our employees. Miscellaneous footage of workers in various areas of the plant complex, inspecting or working on various pieces of infrastructure or equipment. This way, Shell can warrant the safety and health of everyone to a maximum, at and around the site. Close-up of hands turning a vehicle’s steering wheel while driving. Close-up of a yellow safety signboard displaying various warning signs and text. Side view of an emergency vehicle driving past a fire station in which several fire trucks are parked. Wide footage of a parking area and a white building with a Shell pecten located above the entrance, with vehicles passing in the middle distance, and industrial plant infrastructure reaching up into the sky in the background. Mid-view footage, in profile, of a woman donning her safety helmet, plant infrastructure in the background. The woman mounts her bicycle and rides out of shot. We also take future-oriented steps to be more environmentally-friendly. Low angle footage of sheep eating grass, the oil storage tanks in the background. For instance, think of the greatly reduced use of natural gas, made possible because we send large amounts of CO2 to the Westland. Bird’s eye view of an industrial plant complex seen across a body of water, the tall structures of the complex reaching up into a blue sky. Footage of a line of greenhouses, a canal and grassy banks running alongside. Panning bird’s eye footage of the greenhouses. Another example is our residual heat project. From 2018 onwards, we supply enough residual heat to the city of Rotterdam to provide thousands of houses with hot water and heating. Animated graphic of plant infrastructure, shaded in orange, a dotted red line moving between buildings indicating heat, and as it moves through a tank shaded in blue, the dotted line becomes a yellow line. The graphic zooms out to show a second plant at frame-right, shaded in blue. Above the second plant, a red temperature gauge appears in the blue sky, the rising red line indicating rising temperature. This cuts to a graphic of a house, the blue-shaded plant now in the background, with a yellow line running below ground and up into the house. The front wall of the house is removed, showing the residual heat being piped into the home to meet heating needs. Our new SDA plant also plays its role, as it’s going to remove asphalt from fuel oil components. Miscellaneous footage, switching back and forth between panning bird’s eye footage of an industrial plant complex, and panning footage of the model of the Solvent Deasphalter unit (SDA) for Pernis. Landscape footage of a grassy area with trees where people are seated on chairs and park benches, looking out over a body of water; in the background, industrial plant infrastructure reaches up into the blue sky. Thus, from the same amount of crude oil, more valuable and cleaner products can be obtained. Panoramic time lapse footage, as seen across the water, of an industrial plant complex, the tall chimney and other structures reaching up into a blue sky filled with scudding clouds. High angle view of the tops of storage tanks and plant infrastructure with a skyline of buildings visible in the distance. Footage of an urban street lined with buildings and parked cars, as one vehicle turns into the street. Footage of pedestrians walking along an urban street, also lined with buildings and parked cars. In 1998, we established the Community Council to discuss issues in a structured way, to create understanding for each other’s situation. Of course, we also think of the future. That’s why we also have our own Children’s Council. This enables us to offer a programme to local young people in the fields of technology, safety and the future of energy. Footage of a group schoolchildren, wearing coveralls, visiting plant facilities. A man speaks to them and they respond enthusiastically, some raising their hands to ask questions. Reverse view footage of the children walking within plant facilities. Close-up of the children donning their safety goggles. Footage of the children seated around a large oval boardroom table, while a man stands in the foreground, addressing them. Footage over one of the student’s shoulders of a brochure that he is holding in his hands and reading. Panoramic time lapse footage, as seen across the water, of an industrial plant complex, the tall chimney and other structures reaching up into a blue sky filled with scudding clouds. Low angle footage of cars approaching on a highway and passing the shot. Reverse view footage of traffic on a highway. Energy issues are constantly changing. Panning bird’s eye view of an industrial plant complex. Reverse view footage of an airplane landing on a runway, other aircraft in the background. The demand for petrol and diesel for passenger traffic will decline, but there will be a continuous demand for fossil fuels for heavy transportation. In the past, we have always moved with the times, and we’ll continue to do so. So we think that Pernis has a bright future ahead of it. 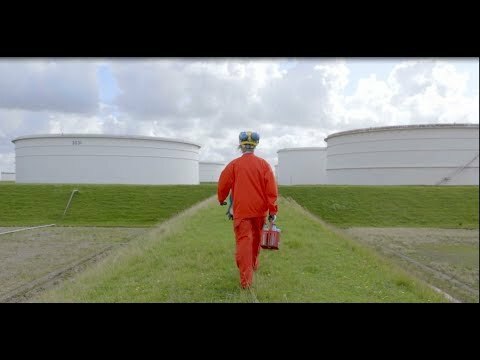 Reverse view footage of a worker carrying a container and walking across grass towards an area of oil storage tanks. Mid-view of a smiling man in a blue shirt standing just outside the entry to the floor of a section of the plant. Mid-view of a smiling woman wearing safety gear, standing against a background of large pipes and industrial plant infrastructure. Mid-view of a smiling young man wearing safety gear, an internal plant floor with machinery forming the background. Mid-view of a smiling young woman wearing a white lab coat and safety goggles, a laboratory setting forming the background. Mid view of a smiling young man wearing safety gear, an internal plant floor forming the background. Mid view of a smiling young woman wearing safety gear, standing against the background of industrial plant infrastructure. Low angle time lapse footage of oil storage tanks, a large Shell pecten visible on one of the white tanks, while clouds race through the blue sky above. Omschrijving: Shell, Havenbedrijf Rotterdam en Warmtebedrijf Rotterdam hebben samen met Bas Kurvers, wethouder Bouwen, Wonen en Energietransitie gebouwde omgeving, het Pernis Restwarmte Initiatief feestelijk ingeluid, nu de infrastructuur om warmte te kunnen leveren gereed is. Met dit initiatief levert Shell samen met partners een bijdrage aan de versnelling van de Nederlandse energietransitie door 16.000 Rotterdamse huishoudens te verwarmen met restwarmte afkomstig van de raffinaderij in Pernis. Key words: restwarmte, duurzaamheid, Pernis, Warmtebedrijf Rotterdam, Havenbedrijf Rotterdam, Shell. Shot van schuifpuzzel in speeltuin SV Katendrecht, de puzzel en aanwezige stakeholders. Bas Kurvers staat voor de gelegde schuifpuzzel in speeltuin SV Katendrecht. Stakeholders en kinderen klappen nadat de puzzel succesvol in elkaar is geschoven. Vooraanzichten van verschillende huizen in Rotterdam passeren de revue. Tekst (Bas Kurvers): Vandaag is hier in de speeltuin op Katendrecht het startshot gegeven voor het aansluiten van de restwarmte van Shell Pernis voor 16.000 huishoudens op het warmtenet. En dat is fantastisch nieuws! Allard Castelein staat voor de gelegde schuifpuzzel in SV Katendrecht. De schuifpuzzel wordt van dichtbij gefilmd, met nadruk op het woord ‘restwarmte’ en de pijpleidingen. Tekst (Allard Castelein): Wij zijn heel blij met Shell Pernis als een hele efficiënte fabriek. Nu met de uitkoppeling van warmte wordt het nog efficiënter. Marjan van Loon staat voor de gelegde schuifpuzzel in SV Katendrecht. Samen met andere stakeholders en aanwezige kinderen legt ze de schuifpuzzel zodat de samenwerking tussen verschillende partijen zichtbaar wordt. Kinderen zetten stappen op de schuifpuzzel. Tekst (Marjan van Loon): En dit restwarmte project laat zien wat je dus kan doen om daar stappen in te nemen. Co Hamers staat voor de gelegde schuifpuzzel in SV Katendrecht. De schuifpuzzel is te zien, evenals de zon achter de wolken die Rotterdamse bebouwing verlicht van achter. Tekst (Co Hamers): Er wordt door het leidingsysteem van het Warmtebedrijf Rotterdam warmte geleverd aan Rotterdam. Kinderen houden hun bakjes popcorn omhoog en doen relevante proefjes over restwarmte samen met Bart Kneppers van MadScience bij een tafel op een klein heuveltje zodat de proefjes goed te zien zijn. Jos van Winsen staat voor de gelegde schuifpuzzel in SV Katendrecht. Stakeholders van Shell discussiëren met elkaar na afloop van het evenement. Tekst (Jos van Winsen): Ik ben er blij om. Het is een project waar we zo’n jaar of 4 aan gewerkt hebben met een heel team. Bas Kurvers staat voor de gelegde schuifpuzzel in SV Katendrecht. Vanuit het publiek is te zien hoe MadScience met hulp van een van de aanwezige kinderen een proefje doet. Tekst (Bas Kurvers): Want hier komt de haven echt naar de stad toe en kunnen we werken aan een betere toekomst voor onze kids. Jos van Winsen staat voor de gelegde schuifpuzzel in SV Katendrecht. De pijpleidingen en Rotterdamse huizen op de schuifpuzzel zijn te zien. Tekst (Jos van Winsen): En we zijn vandaag zo ver om binnenkort te warmte te gaan leveren aan de buren. Co Hamers staat voor de gelegde schuifpuzzel in SV Katendrecht. Vooraanzichten van Rotterdamse huishoudens worden gefilmd. Tekst (Co Hamers): De warmte gaat naar gebouwen zoals hier in de omgeving. Marjan van Loon staat voor de gelegde schuifpuzzel in SV Katendrecht. Stukken van de puzzel worden in elkaar geschoven. Tekst (Marjan van Loon): Die samenwerking is wat mij betreft hier dus de sleutel tot het succes. Logo van Shell met ‘Shell International Limited 2018’. De interne onderzoeken naar de incidenten die in juli 2017 plaatsvonden, zijn afgerond. Jos van Winsen – general manager Shell Pernis – legt uit wat er is gebeurd. On Saturday July 29th 2017, an incident occurred at Royal Shell’s Pernis refinery, the largest in Europe. A fire started in a power supply station leading to a power outage affecting a number of units. Shell Pernis shut down most of its production units in a safe and prompt manner, resulting in flaring which is part of the safety system when units are taken out of operation. Late on Monday, there was a second incident; a hydrogen fluoride leak while one of the units which had been taken offline was being flushed – a necessary cleaning measure after the fire. The source of the leak was identified, while no hazardous concentration was measured outside the site. All appropriate agencies were notified and there were no injuries associated with this incident. In this video, we talk to Jos Van Winsen to follow up on the incidents. Industrial scene. Wide-angled view overlooking the Pernis site. Text appears onscreen as displayed below. Last July, Shell Pernis experienced two incidents which had a large impact in the near vicinity. On 29th July, a short-circuit in a high voltage station led to the complete shutdown of nearly all the plants. Two days later, a hydrogen fluoride pipeline sprang a leak, which caused gas to escape to the outside air. Wide-angled view of the Shell Pernis refinery and highway with many trucks. Grass blowing in the foreground. View of a park overlooking a lake with people sitting on benches. On the other side of the lake, the Pernis site. View of the high voltage power station building at Pernis with a network of pipes in the foreground. Close-up of a bright yellow notice on a wall with text reading ELEKTRISCHE CENTRALE C4 VEILIGHEIDSDISTRICT RDU and two red lightning bolts on either side of the text. Shot panning left to right over the Pernis site showing the many factories, buildings and chimneys. Shot of a refinery building under construction with lots of scaffolding. Shot panning right to left showing a complex network of pipes, machines, chimneys and buildings. Wide-angled view of the Pernis site. 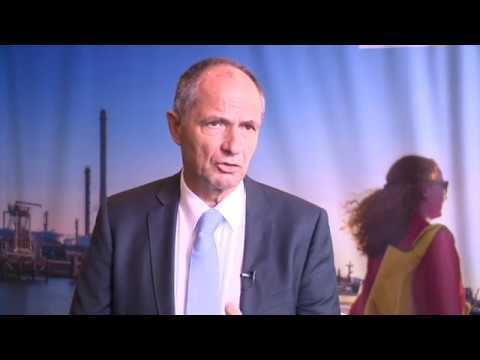 Close-up of Jos Van Winsen speaking to off-screen interviewer at an interior location, behind him a large image of a refinery and a female walking past. On the night of 29th July, a high voltage station to my right had a short-circuit. This led to the breakdown of numerous electrical systems. This always causes plants to shut down automatically. When a plant shuts down, we must safely dispose of any gas that is present. Safety systems send the gas to the torch, so the torch will burn with an extremely large flame. Normally, we add steam to avoid any soot production. But due to the domino effect of the power outing, we didn't have enough steam so we couldn't add steam to the torch, which, as a consequence, produced more soot than normal. The power outing has caused the shutdown of a number of plants. We then had to shut down more systems to relieve the power station. Once we had closed down that part of the refinery, we have decided to shut down the rest of the refinery in a controlled way. This went well. View of the high voltage power station building at Pernis with the yellow notice on the wall, a network of pipes in the foreground. Shot panning left to right of a large round structure and two white electrical machines. Interior shot of a room with large fuse cabinets on both sides, a doorway at the back. Camera pans left to focus in on several of the fuse cabinets which have various displays on the front. Back to close-up of Jos Van Winsen. A power station like that has an enormous number of connections, but it is a high-voltage station at 25,000 volts so you have heavy cables with high-tech connectors, so to say, which are quite a bit larger and serious than your household connectors. They connect cables and in one of them, a failure occurred - a short-circuit. At 25,000 volts, a short-circuit causes an arc to form with fire as a result, so we had to put out a fire in that station. Interior shot panning left to right of a complex network of electrical wiring and connected piping. Close-up shot of a voltage cabinet and cabling as camera pans down. Close-up of white sign on a wall with text reading C 2503 IS-LIMITER. Close-up of an electrical cabinet with three rows of industrial splicers and connectors as the camera pans down. Back to close-up of Jos Van Winsen. The real cause of the failure of this bus duct connector has been under investigation for some months now by the DNV-GL, ex KEMA, but we still don't have a clear idea. Interior shot of a room with tables and chairs. In the foreground, a cross-section of the failed piece of equipment where the fire started. Zoom in and pan right showing copper on the inside affixed with nuts and bolts. Then what happened on 31st July? A strong acid, and 350kg of butane have escaped from a 20mm leak. Back to close-up of Jos Van Winsen now standing behind a round table. On the table, a model of a cross section of yellow piping. I have ordered a model, because it was a combination of factors. With that plant, after starting up... there is a connecting tube between two pieces. Normally, the joints are sealed on both sides with so-called spectacle flanges. One of the spectacle flanges was left open, so the tube was in an open connection with the pipeline containing HF-butane. Zoom in on the model as Jos Van Winsen gesticulates. Back to close-up of Jos Van Winsen standing behind the table with the model. Back to close-up of the model as Jos Van Winsen points to various parts of the pipe. Close-up of Jos Van Winsen opening and closing the spectacle flanges on the model. He then lifts the cross section up at one end and points to the T-section at one end of the pipe. This in itself is not a problem, but after the shutdown, because this pipe was slightly sloping, like this - it was slightly exaggerated - there was a small puddle of water after the shutdown. That was not properly disposed of. HF and water form a very aggressive acid, which burned through the metal and caused a leak. As I said, when a leak occurs, the plant has many sensors in place to detect a HF or butane leak. The sensors tripped, and we have safety systems to create water curtains around any leaks to neutralise the outflow. The fire brigade targeted the spot with a water cannon. The escalation with the Veiligheidsraad functioned well, so we managed to contain the HF butane mixture within the compound. Wide-angled shot panning left to right across the Pernis site. Were the two incidents related? No, they weren't. Since the shutdown in 2015, the flange had been in the wrong position and there was a bit of water. It had been corroding for a year and a half and, incidentally, it caused this leak. It could have happened a few days earlier or a few days later. The connection tube is inspected regularly and it has always been marked as safe, so its age is not an issue. But since a spectacle flange was left open and there was some water inside - two very unusual situations - this was what happened. Back to close-up of Jos Van Winsen and the model. Zoom in on the model as Jos Van Winsen points to the T-section. Back to close-up of Jos Van Winsen and the model. It has been said that these two incidents are below Shell's standards. Is it still safe to be here on the site? Exterior shot panning left to right across the Pernis site. Back to close-up of Jos Van Winsen and the model. Yes, it is safe to be here. We do everything we can, hence we carry out these studies to learn what has gone wrong and to see what we can learn from it. And we include all of this in our processes, and it's expected of our employees and in the checks we do to continually seek improvements. We do this together with our colleagues in the Botlek area and throughout Shell. We learn from each other in order to be better neighbours. View of the Pernis site as seen across the water. View of a neighborhood in proximity of Pernis with rows of houses, parked cars, trees, some traffic and the top of a factory chimney popping up behind one of the houses. Can you guarantee it won't happen again? Wide-angled view of a large building with the Shell pecten logo, part of the industrial site to the side, many road lights and grass blowing in the foreground. Back to close-up of Jos Van Winsen with the model. We can't guarantee that, but we can guarantee to always do our absolute best. We're very sorry that we haven't been the neighbour we want to be, but we will do our utmost to avoid this kind of incident ever occurring again. Fakkelinstallaties vormen een belangrijk onderdeel van onze veiligheidsvoorzieningen. Ook deze installaties moeten worden geinspecteerd. Bij Shell Pernis zetten we daarvoor drones in. Uniek door extra vereisten in verband met de nabijheid van Airport Rotterdam-The Hague. 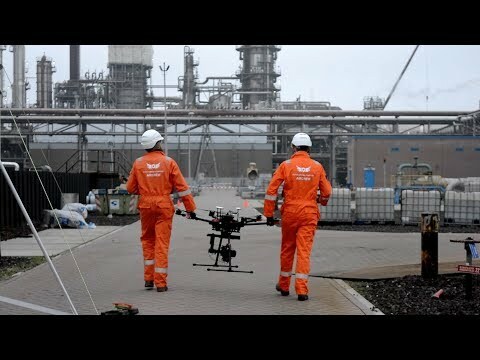 Safer remote operated drone inspection of the Shell Pernis flare system, in collaboration with the Dutch Drone Company. Soft instrumental music featuring synthesised musical effects, keys, and increasing in rhythm and intensity towards the close. Low angle footage of a man dressed in safety gear working in the foreground, the flare system of Shell Pernis visible in the background against a blue sky. Close-up of the man, head bent over his work, factory infrastructure in the background. Low angle footage of the tall torch installation seen against the sky, flaring and smoking. Onbemande inspectie wordt uitgevoerd op de fakkelinstallatie, 100m. High angle close-up of the drone, stationary on a paved area, while men dressed in safety gear move around it. Close-up of the drone’s remote control and related equipment. Close-ups of one of the men leaning over, operating the control equipment, factory infrastructure visible in the background. Close-up of the top of the drone, red light flashing. More footage of the man bent over the controls. Low angle close-up of an antenna seen against the sky, cutting to a wider shot of the antenna alongside the tall torch installation. Dit is een bijzondere vlucht vanwege de nabijheid van het vliegverkeer van Rotterdam-The Hague Airport. More footage of men surrounding the drone and controls, a vehicle with Dutch Drone Company signage in the background. Footage of the two men lifting the drone and carrying it along the paved area to an area in the distance, still with the factory infrastructure in the background. Close-up of the screen reflecting data and imagery from the drone footage, which currently shows the paved area. Wide footage of the drone taking off into the sky. Low angle footage of the drone against the sky. Er is hier special toestemming voor verleend, doordat de drone een transponder bij zich had. Close-up of the screen displaying drone footage and data, showing the pipes and infrastructure of the torch installation from various angles. Low angle footage of the drone and torch installation, seen against the sky. Hierdoor was de drone zichtbaar op de radar en kon er een uitzondering worden gemaakt. Close-up of the screen displaying drone footage and data, showing again the infrastructure of the torch installation from various angles as it pans up the installation. De fakkel kan blijven branden en mensen hoeven niet op grote hoogte de inspectie uit te voeren. Continuing drone footage of the infrastructure of the torch installation from various angles, slowly panning up the installation. Low angle footage of the drone and installation, seen against the sky. Wider view of the screen displaying drone footage, a man dressed in safety gear seen in reverse view in the foreground, as he looks at the footage, showing the flaring torch at the top of the installation. A hand appears, pointing towards the screen. Hierdoor wordt de inspectie een stuk veiliger. Bird’s eye view of the torch installation, the flaring visible against the background of factory infrastructure, cutting to a closer view of the torches. Low angle footage of the drone and installation, seen against the sky. Aerial view of the flaring torches. Close-ups and extreme close-ups of the torch openings. Front view footage of the two men carrying the drone along the paved area, factory infrastructure forming the background. Footage of the two men walking towards the shot. Footage of one of the men standing alongside a surveying instrument which is planted on the paved area against the background of factory infrastructure. Wide bird’s eye view of factory infrastructure at Shell Pernis. Instrumentaal tot einde film. Voluit zonder gesproken tekst, zachter wanneer geïnterviewden aan het woord zijn. 1.1 Raffinaderij Shell-Pernis, gefilmd vanaf een hoog punt. Camera zwenkt naar links. 1.3 Close-up van een tank met Shell-logo op tankgrootte. Op de voorgrond een rode afsluitkraan. Camera zoomt in. 1.4 Drie tanks achter elkaar. Camera naar links. 1.5 Tekst in beeld verdwijnt. Tekst van geïnterviewde De Jong zet in. 2.1 Zelfde als 1.5: drie tanks achter elkaar, camera die naar links zwenkt. 2.2 Op voorgrond geïnterviewde De Jong in rode overall en helm op, die aan het woord is. Op de achtergrond de robot en daarachter twee manshoge blauwe containers met een steiger rechts ernaast. Een stroomkabel tussen de robot en een van de blauwe containers. 2.4 Raffinaderij Shell-Pernis, gefilmd vanaf een hoog punt. 2.5 Close-up van een aantal olietanks. Op de voorste tank een regenboogvlag en tankgrote Shell-logo. 2.6 Op voorgrond geïnterviewde De Jong. Op de achtergrond de robot en daarachter de twee blauwe containers met de steiger rechts ernaast. Een stroomkabel tussen de robot en een van de blauwe containers. 2.7 Robot totaal in beeld met draaiende koppen. Op de achtergrond twee olietanks en links een vacuümwagen. De arm van de robot gaat omhoog en omlaag. 2.8 Close-up van de robotarm die loskomt van een vervoerswagen. De camera zwenkt naar links en volgt de arm die omhoog gaat. In het verleden gingen de mensen naar binnen om een tank schoon te maken. Normaal zijn er vier mensen daar acht tot tien uur per dag in de tank door de sludge heen te lopen. Met adembescherming en onder hele zware omstandigheden. En toen hebben we bekeken, wat zijn dan de mogelijkheden om dat te voorkomen, dat het beter kan worden. En zijn we eigenlijk op de robot uitgekomen als beste vervanging, om in de toekomst tanks schoon te maken. 3.1 Geïnterviewde Molkenboer in werkkleding staand bij de robot. Op achtergrond de vacuümwagen en tanks. 3.3 De robot rijdt zelfstandig over een stellage die naar de ingang van een tank leidt. 3.4 Close-up van de afvoerpijp. Camera volgt, naar onderen en naar rechts, de pijp naar de vacuümwagen. De vacuümwagen staat tussen twee olietanks. Links staat geïnterviewde Molkenboer toe te kijken die richting vacuümwagen loopt. Dit apparaat gaat door middel van de rupswielen richting de tank en dan in de tank. Eenmaal in de tank wordt er gezogen door de pijp en dat wordt vervolgens afgevoerd naar de vacuümwagen. 4.1 De Jong en Molkenboer, en twee andere medewerkers in werkkleding, kijken naar de werking van de robot. 4.2 Close-up van een in beeld rijdende robot die naar de ingang van de tank rijdt. 4.3 Close-up van Molkenboer die toekijkt. Camera gaat naar onderen en De Jong en de twee andere medewerkers in werkkleding komen in beeld. 4.4 Op de voorgrond geïnterviewde De Jong, op de achtergrond robot en daar weer achter de twee blauwe containers met de steiger rechts ernaast. De stroomkabel tussen robot en de blauwe container. 4.5 Vooraanzicht robot met draaiende koppen aan de afvoerpijp. De robotarm beweegt omhoog. We zijn eigenlijk samen om de tafel gaan zitten en hebben gezegd, welke manieren zijn er wereldwijd. We hebben eigenlijk alle manieren die er zijn bekeken, we zijn op verschillende locaties wezen kijken. En ja, je kunt terugvallen op het oude dat er al bestaat. Maar we willen eigenlijk een stap vooruit maken. En daar is deze robot, ja, een prachtig voorbeeld van. 5.1 Close-up van twee hangende camera's. 5.2 Close-up van één camera. 5.3 Op voorgrond sprekende geïnterviewde Molkenboer. Op achtergrond een stellage. 5.4 Robot stilstaand op stellage voor ingang tank. Aan de robot gekoppeld de afvoerpijp. Camera volgt de pijp die uitkomt op een van de blauwe containers waarin een medewerker zit die naar twee beeldschermen kijkt. 5.5 Een medewerker in werkkleding kijkend naar de twee beeldschermen. Vervolgens hebben we overal nog camera's geplaatst. De camera's zijn er voor dat je zowel aan de achterkant als aan de voorkant kunt zien wat er gebeurt. Want er is niemand bij, in die tank. 6.1 Op voorgrond geïnterviewde De Jong, achtergrond robot met de twee blauwe containers, steiger rechts ernaast en stroomkabel tussen robot en de blauwe container. 6.2 Robot rijdt zelfstandig over de stellage naar ingang tank. 6.3 Close-up van in beeld rijdende robot richting ingang tank. Nou, het grote voordeel op HSE-gebied, dat er geen mensen meer in hoeven. Maar in de loop van de tijd zal het zeker sneller gaan worden, dan we nu doen. En ja, dan is het ook goedkoper. 7.1 Zelfde als 6.3: close-up van in beeld rijdende robot richting ingang tank. 7.2 Op voorgrond geïnterviewde De Jong, achtergrond robot met de twee blauwe containers, steiger rechts ernaast en stroomkabel tussen robot en de blauwe container. Het is uniek voor Shell. Bij Shell Nederland is het voor het eerst nu en we gaan dit ook zeker wereldwijd uitdragen. Als het dan een succes is, kan het op de andere locaties ook gebruikt gaan worden. 8.1 Close-up van robot die de tank binnenrijdt. 8.2 Raffinaderij Shell-Pernis, gefilmd vanaf een hoog punt. De camera zwenkt naar links. Sinds vanmorgen zijn er bij DCMR geluidsklachten binnengekomen veroorzaakt door het fakkelen bij Shell Pernis. Sinds eind januari voert Shell Pernis groot onderhoud uit aan 13 fabrieken. De onderhoudsstop is nodig om veilig en efficiënter te kunnen werken. De fabrieken en installaties worden van binnen en buiten geïnspecteerd, schoongemaakt en waar mogelijk verbeterd. In verband met operationele problemen op een van onze fabrieken, is er sprake van verhoogd fakkelaanbod en een zichtbare fakkel. Een goed en open contact met onze omgeving vinden we heel belangrijk. Drie jaar geleden kondigde Shell de bouw van een nieuwe fabriek op Shell Pernis aan: de Solvent Deasphalter (SDA)-fabriek. Shell, Havenbedrijf Rotterdam en Warmtebedrijf Rotterdam gaan samen een bijdrage leveren aan de versnelling van de Nederlandse energietransitie door efficiënt gebruik te maken van bestaande energie en 16.000 Rotterdamse huishoudens te verwarmen met restwarmte afkomstig van Shell’s raffinaderij in Pernis. Het Pernis Restwarmte Initiatief gaat september 2018 van start. Goede buren communiceren met elkaar, leren van elkaar, krijgen een band, helpen elkaar en maken het leven in de buurt wat aangenamer. Een goed en open contact met onze buren vinden we belangrijk. Daarom is er al vijftien jaar een Burenraad van Shell Pernis. We hebben een groot aantal boeiende vacatures in Pernis en Moerdijk, op alle niveaus en van starters tot ervaren professionals. Vind hier wat bij je past. Shell Moerdijk maakt chemische producten op basis van aardolie.